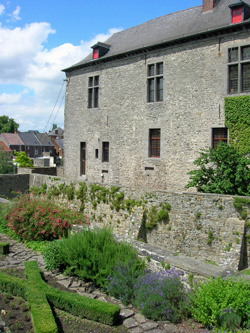 The castle of Ecaussinnes-Lalaing is one of the rare example of elevated medieval fortress in the flat province of Hainaut. It is made of local grey stone and possesses seven round or square towers. Property of such great families as the Croÿ, the Arenberg, the Lalaing and the van der Burch, the castle has retained its appearance and furnishings from the 15th and 18th centuries, which adds to its attractiveness. 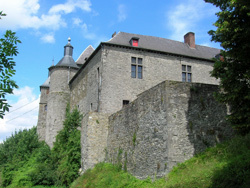 The castle of Ecaussinnes-Lalaing developed early in the Middle Ages thanks to its strategic position on a rocky promontory overhanging the valley of the Sennette, at the boundaries of the County of Hainaut with the Duchy of Brabant. The first mention of a stone castle was in the 12th century. in 1357, Joan, daughter of Hoste of Ecaussinnes, marries Simon of Lalaing, Grand Bailiff of Hainault and Seneschal of Ostrevant. Simon became lord of Ecaussinnes upon his father-in-law's death. The line of Lalaing would give the second part of its name to the castle and village. The castle was however to pass briefly to another family, after the daughter and only heir of Simon III, Mary, espoused John I of Croÿ, Count of Chimay and Grand Bailiff of Hainault. The house of Croÿ would rule over Ecaussinnes from 1476 to 1529. John I transformed the defensive fortress into a residential castle worthy of his rank of councillor of the Duke of Burgundy. When he died in 1516, the castle passed to his brother James, Bishop of Cambrai, who sold it to his nephew Charles, first Prince of Chimay. His daughter, Margaret, inherited Ecaussinnes. She married Charles of Lalaing, thus bringing back the seigneury to their former lords. After troubled times during the Spanish occupation of the Southern Netherlands, Florent of Berlaymont and his wife Margaret of Ecaussinnes-Lalaing sold the estate in 1624 to Philip van der Burch. The new owner had been a magistrate of the court of justice of Bruges, and had recently been appointed Grand Bailiff of Hainault by the Archdukes of Austria Albert and Isabella. It is interesting to note that when the castle passed into the houses of Lalaing and Croÿ, the first new occupants also held the same position of Grand Bailiff of Hainault. 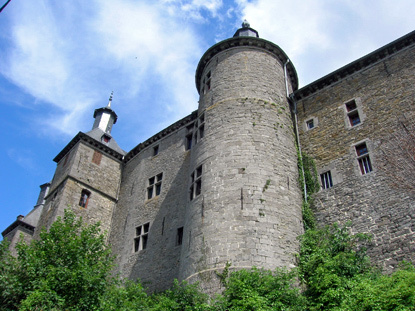 For 230 years the castle of Ecaussinnes-Lalaing was the home of the van der Burch. Antoine-Félicien van der Burch (1670- 1736) did a lot to improve the castle's appearance, such as laying out the gardens. He was granted the title of count by Emperor Charles VI. When Count Charles van der Burch died in 1854, the new Napoleonic law prohibiting to bequeath all or most of one's properties to one child at the expense of the others, the heirs were forced to sell the castle to divide. 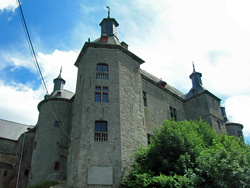 It was acquired by the Duke of Arenberg, who only rented out the land and left the castle uninhabited. Occupied by the German, then Canadian troops during the First World War, the castle narrowly escaped from being transformed by industrialists into working-class housing units after the war. 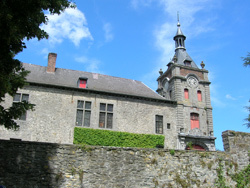 Canon priest Puissant started some renovations, then convinced Count Adrien van der Burch, a descendent of the past proprietors, to purchase the castle and restore it to its former glory. 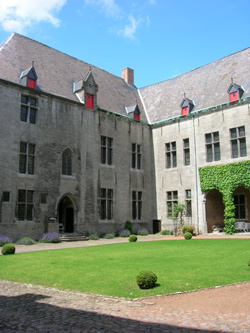 The count's son having died during WWII, and lacking other relatives, he created the "van der Burch Foundation" in order to preserve the castle after his death, which occured six years later. The president of the foundation is now the Professor Cauchies from the UCL. 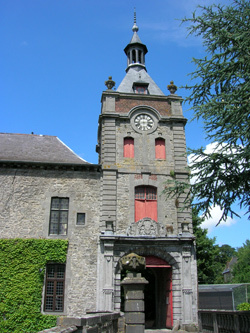 the castle is inhabited by Count Robert d'Ursel, administrator of the foundation, and his wife, who is vice-president. Only a part of the castle is open to the public - the so-called "museum" section. The ground floor makes up the medieval part of the castle. It has an armoury, a jail, as well as a kitchen and a bedroom with 15th-century furniture. The drawbridge was converted into a Gothic chapel in the 15th century. The upper floor was redecorated like in the 18th century. It possess a large living room, a glass room and a porcelain room, with porcelains from Tournai, Brussels and naturally also from China. Let's also note the magnificent 500-year old fireplaces of the Croÿ family, and the collection of portraits of the van der Burch family dating from the 16th to the 20th century. The gardens, originally created in 1720, were refurbished in 1930. The castle is open from 10:00 am to 12:00 noon and 2:00 pm to 6:00 pm from 1 April to 31 October, everyday except Fridays in July and August, and on weekends and holidays only the rest of the time. Guided tours for groups (min. 20 people) are available every between April and October with a reservation. Admission is 8 € for adults, 6 € for seniors and students and 5 € for children. Ecaussinnes-Lalaing is 2km north of the E19 motorway (exit 20), not far from Seneffe and Le Roeulx.